Drink to the saints in high style with these great products. And there’s more to come! 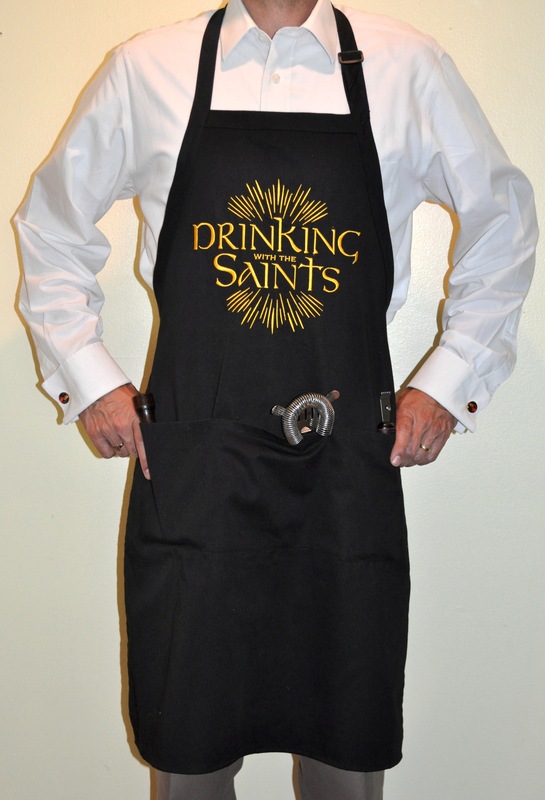 Scroll down for an: 1) Apron, 2) Cufflinks, 3) Measuring Glass, 4) Saints’ Wine Charm Kit, and 5) Coasters. The Drinking With the Saints apron is practically a work of art. This sturdy Port Authority apron in a black poly-cotton blend features stain release technology, a waist strap and adjustable neck strap, and three commodious pockets for your bartending accessories. Best of all is the Drinking With the Saints logo sewn onto the apron with dazzling gold thread, which took a machine 90 minutes and 28,000 stitches to make! (All done, we should add, in the USA.) The DWTS apron is also professional-grade length, measuring in at 25” wide and an impressive 34” long. The perfect blend of taste and quality with a dash of whimsy, the DWTS apron makes an excellent gift for yourself or your favorite mixologist. Each Apron is $35, not including shipping and handling. To purchase, click here. The DWTS cufflinks (gift box sold separately). Now you can wear your heart on your sleeve (kind of) with these handsome cufflinks featuring our Drinking With the Saints mascot Cardinal Foodie (for more on His Eminence, click here and scroll down). 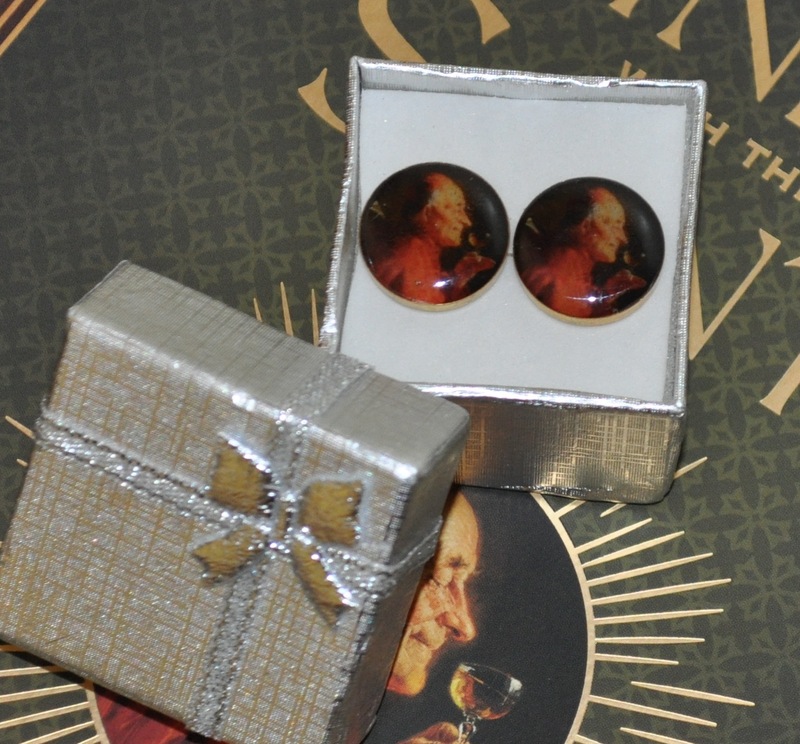 The cufflinks, assembled by hand in the U.S.A., have a gold metallic casing and a hard resin finish that magnifies Grutzner’s charming image of a Cardinal savoring his beverage. Perfect for all semiformal attire and subtle enough even for a tuxedo (studs not included), the DWTS cufflinks will enrich the wardrobe of any gentleman. Each pair of cufflinks is $16, not including shipping and handling. To purchase, click here. 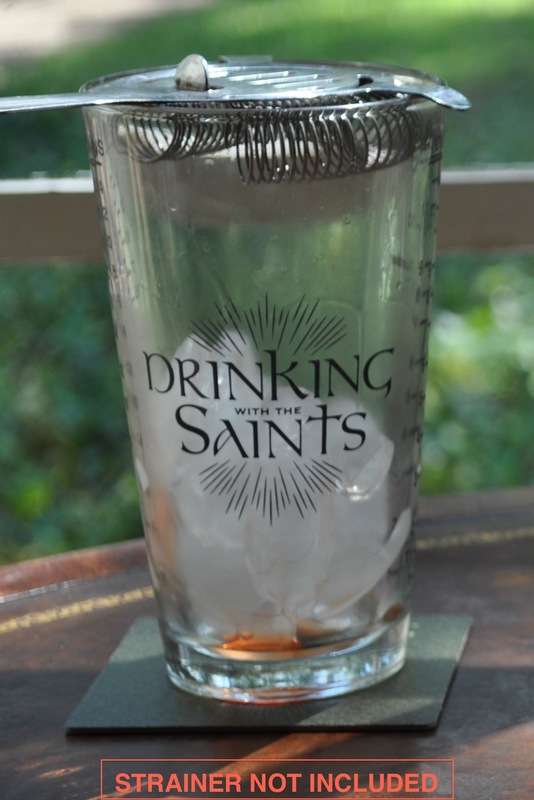 Our Drinking With the Saints measuring glass was custom designed to make home bartending a breeze. The glass comes with two measurement scales—one in ounces and one in tablespoons—that allow you to mix the ingredients of several cocktails at once before pouring into a shaker. Or, you can simply add ice to the measuring glass, stir, and strain! The DWTS measuring glass is ideal when you have more than one drink to prepare and are tired of using those tiny shot measuring glasses over and over again. Most mixing glasses feature cocktail recipes on them instead of the more practical measurement scales, and the ones that do have measurements tend to be of poor quality: one glass we tested lost its markings after only a few gentle hand washings! The Drinking With the Saints measuring glasses are useful, accurate, durable, and handsome. They can even double as beer pint glasses: you can monitor your drinking progress ounce by ounce (grin). Each Measuring Glass is $10, including shipping and handling. To purchase, click here. Invoke the intercession of a saint as you keep track of your wine or cocktail glass with these saintly wine charms. Our Drinking With the Saints wine charms kit includes a round tin for easy storage and a set of eight different medals featuring the some of the most popular figures in the Catholic communion of saints: St. Joseph, St. Jude, St. Benedict of Nursia, St. Rita, St. Anthony of Padua, St. Bernadette/Our Lady of Lourdes, St. Therese of Lisieux, and Pope St. John Paul II/Divine Mercy. Each medal is 7/8” long and made in Italy out of a beautiful silvery pewter. And once you purchase your kit, ask your parish priest to bless the medals! Each Wine Charm Kit is $10, not including shipping and handling. Each kit includes: one round tin with the DWTS logo, eight saints’ medals, and eight stem clasps. To purchase, click here. home bar dry and the conversation going. Our coasters feature the smiling Cardinal Foodie (see above) and are made of sturdy 80-point cardstock with a water resistant finish so you can use them more than once. The square design also lets the coasters double as bookmarks. Put one in the Saints section of the book, one in the Seasons section, and one in the Index! DWTS Coasters are 5 coasters for $4 or 10 coasters for $8, not including shipping and handling. To purchase, click here. Our generous 8 oz. Cocktail Glasses allow you to enjoy your favorite drink without spilling. The “Drinking with the Saints” logo is made in the same color as the book cover and is dishwasher safe. The DWTS Cocktail Glass is made by Libbey, the industry standard in professional bar ware. DWTS Cocktail Glasses are $8 each, not including shipping and handling. To purchase, click here.